Served cold in bottles or hot in foaming tankards, Butterbeer is a Wizarding World tipple made famous in the Harry Potter books and movies. 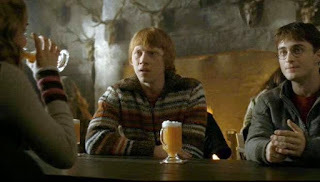 The whole idea of butter beer fascinated me whenever mentioned, I would think, "I wonder what that would taste like?" 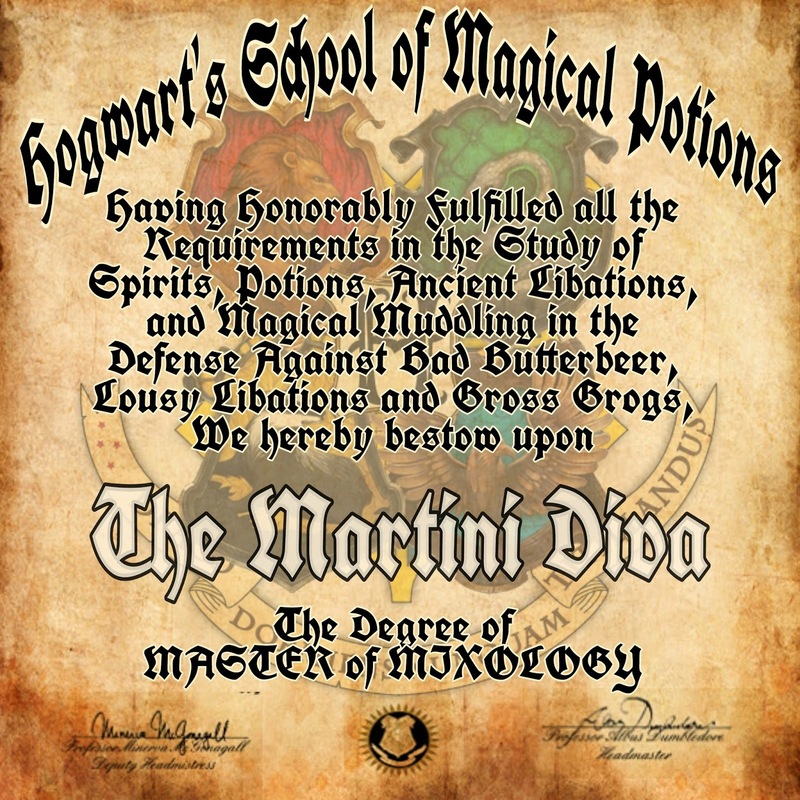 Well, according to J. K. Rowling herself, "I made it up. I imagine it to taste a little bit like less-sickly butterscotch." Okey-dokey, slightly sweet, probably should be carbonated, needs a buttery touch. I needed more to go on so I did a little research and discovered there actually was something called "Buttered Beer" back in Tudor times. There is a recipe in The Good Huswifes Handmaide for the Kitchin' (1588) made from beer, sugar, eggs, nutmeg, cloves and butter. Heston Blumenthal used a recipe from The Accomplisht Cook by Robert May (1664), which has a buttered beer with licorice root and aniseeds when he had his Tudor Feast. However, these don't sound much like the Butterbeer of Harry Potter's World to me, these sound like hot beer flips. Supposedly Butterbeer, which is low in alcohol content, makes house elves drunk but humans have to drink a lot to get inebriated. Well, boo to that. 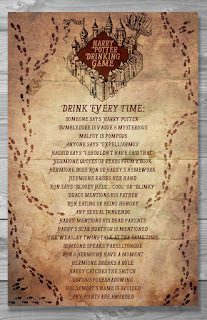 A glass or two of Butterbeer that doesn't get Harry, Ron or Hermione tipsy might be okay for underage students at Hogwarts, but we Muggle adults need a little ABV to get through our magic deprived world ... especially these days. 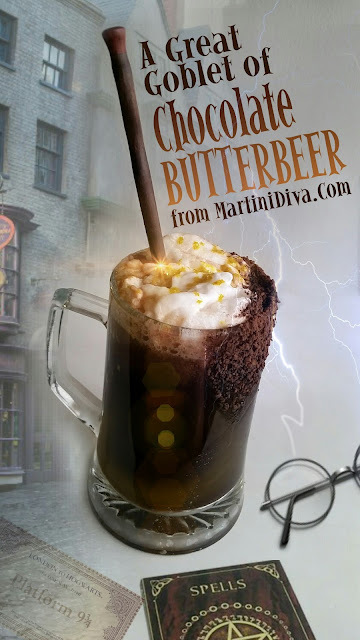 There are a few boozy concoctions out there for "Butterbeer" that make use of rum and butterscotch syrup or liqueurs. These are basically uninspired recreations of Hot Buttered Rum which is a made from rum, butter, hot water or cider, some sweetener, and spices. Seriously? That doesn't sound at all like J.K. Rowling's idea of Butterbeer. Where's the BEER?? May they be consigned to Slytherin House by the Sorting Hat for those abominations. I had to take matters into hand and give us all a viable Butterbeer option before Valdemort joined the fray and added even more nasty potions to the mix. 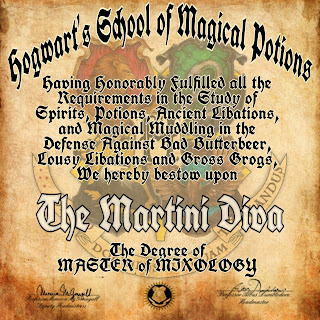 So I grabbed my cocktail wand and cast a little chocolate spell and added some real spirits to the recipe. DIRECTIONS Fill the cocktail shaker with ice the add the bourbon and Butterbeer Simple Syrup. Shake until chilled then strain into your chilled mug or goblet. Add the chocolate stout, top with the Chocolate Bourbon Whipped Cream, garnish and serve. Garnish the same as the adult Butterbeer but use a different magic wand stir stick. DIRECTIONS Pour the milk into an ice filled goblet. Slowly add the syrup, then gently add the cream soda. Using a long spoon, stir well, garnish and serve. 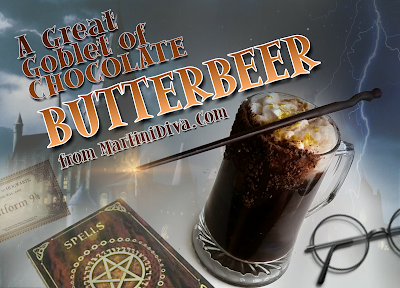 BUTTERBEER SIMPLE SYRUP In a small sauce pan, mix together 1 tablespoon of turbinado sugar with 1 teaspoon of dark cocoa powder and 1/3 cup of chocolate stout. Mix in 2 tablespoons of Torani Butterscotch Syrup and a pinch of sea salt. Warm over medium heat until blended. Lower heat and reduce, stirring constantly, until the syrup coats the back of a spoon. (About 5 minutes.) Remove the pan from the heat and let cool. This will keep for a few weeks in the refrigerator and is great on ice cream and pancakes! Tools: Hand Mixer, Mixing Bowl Chill all the ingredients, bowl and tools. Beat to soft peaks. Will keep for up to 2 days refrigerated. October 31,lst is the end of the First Wizarding War (October 31, 1981) and the first defeat of Voldemort and his Death Eaters by an infant Harry and the original Order of the Phoenix. May 2nd is the anniversary of the Battle of Hogwarts (May 2, 1998) where Voldemort was finally defeated by Harry, ending the Second Wizarding War. July 31st is the birthday of Harry Potter and his creator, J.K. Rowling.